Leif Codices si articola in due sezioni: ‘Landscape’ e ‘Library’. Cliccando su ‘Landscape’, lo spettatore attiva una serie di animazioni dislocate su diversi browser. Il contenuto narrativo fornisce l’anello di raccordo tra le finestre dei browsers, che mostrano diversi elementi appartenenti alla stessa animazione, oppure micro-narrazioni a se stanti che si susseguono confluendo in un’unica macro-narrazione. L’intervento dello spettatore è essenziale all’interno della narrazione: interagendo con l’opera, infatti, egli fornisce l’elemento propulsore che attiva i browser e innesca l’apertura a catena delle finestre i cui vengono visualizzate le animazioni. Cliccando su ‘Library’, si accede a una raccolta di e-Books: Pollen Connection Point, Border Patrol, Party Turnstile, Conflict Mountain, O[c|k]tober, Road Works e Equilibrium Panel, che possono essere scaricate e visualizzate offline in un momento successivo (tranne O[c|k]tober, che costituisce un diario online di immagini tratte da siti web aggiornati quotidianamente dall’artista). 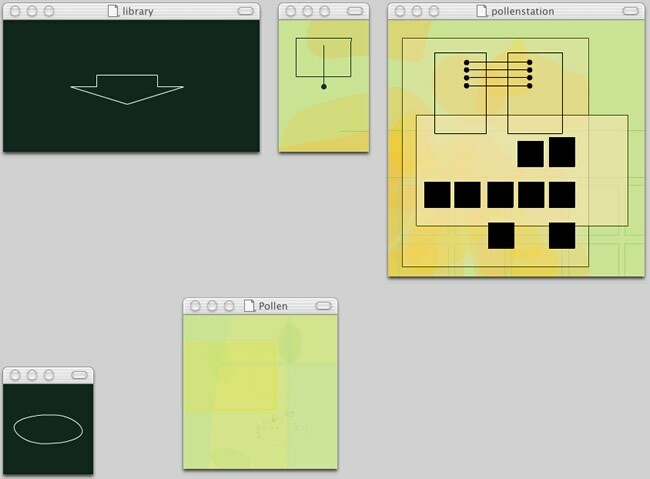 Leif Codices consists of two sections ‘Landscape’ and ‘Library’: ‘Landscape’ takes the viewer through a sequence of online-animations which employ fragmented browser display and user activation as their main formal feature. ‘Library’, is a container for a series of artist eBooks: Pollen Connection Point, Border Patrol, Party Turnstile, Conflict Mountain, O[c|k]tober, Road Works and Equilibrium Panel. With the exception of O[c|k]tober - an online diary of images collected from daily updated websites and linked to news-sites across the world - these books are available for download and off-line viewing. Their often complex structures merge abstract form and literal images in an idiosyncratic investigation into possible meanings of landscape, from the personally obscure to the politically obvious. Le narrazioni di entrambe le sezioni confluiscono in un assemblaggio di immagini astratte e concrete, in una coalescenza di figurativo e non-figurativo che vuole essere una riflessione sulle possibili, talvolte idiosincratiche, connotazioni dell’idea di paesaggio. 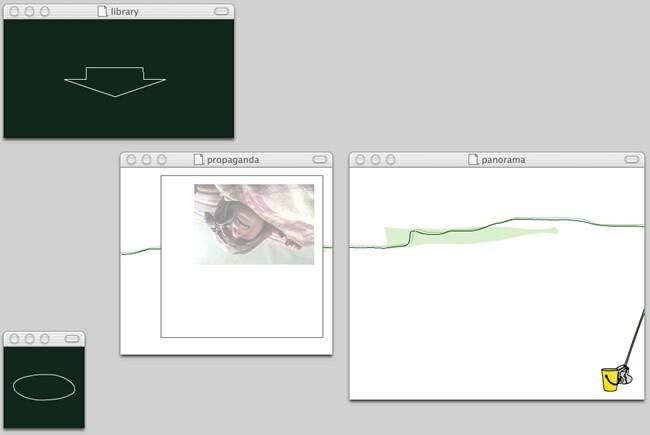 ‘Landscape’ takes the viewer through a sequence of online-animations which employ fragmented browser display and user activation as their main formal feature. The spectator’s intervention is crucial in order to trigger to opening of the browser windows where the animations are visualized. ‘Library’, is a container for a series of artist eBooks: Pollen Connection Point, Border Patrol, Party Turnstile, Conflict Mountain, O[c|k]tober, Road Works and Equilibrium Panel. With the exception of O[c|k]tober - an online diary of images collected from daily updated websites and linked to news-sites across the world - these books are available for download and off-line viewing. Their often complex structures merge abstract form and literal images in an idiosyncratic investigation into possible meanings of landscape, from the personally obscure to the politically obvious. other: The work was made possible through an AHRB Research Fellowship at Newcastle University.